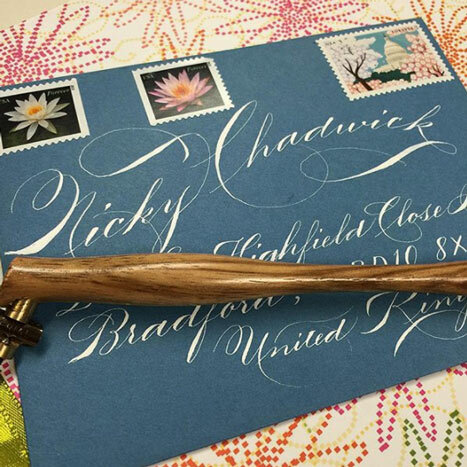 Addressing an envelope with calligraphy is a surefire way to add elegance to your wedding invitations. Use the Calligraphy and Lettering Kit, our Beginners Calligraphy Set, or Elegant Writer Fine Point Calligraphy Pens for your invitations. 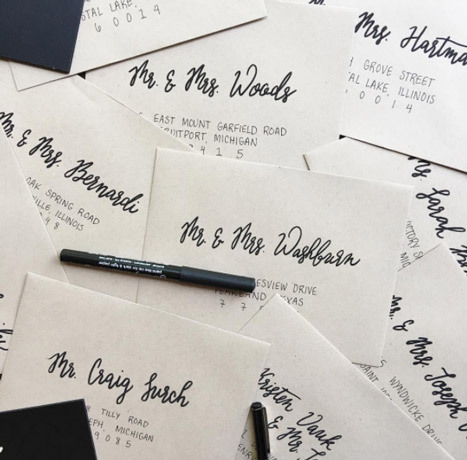 Whether it be fun block lettering or whimsical script, the possibilities for lettering your envelopes are endless! Bring your words to life with Gelly Roll Pens, a brush pen, or a felt tip pen. To improve your hand lettering skills (or just get some new ideas), consider attending our Creative Hand Lettering Workshop. One of our associates will help you discover unique and beautiful ideas for your invitations. 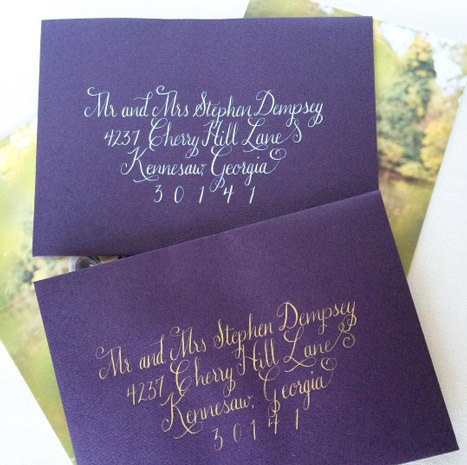 Though this may be time-consuming, using letter stamps to address your invitations will yield impressive results. We recommend using a set such as the Prima Press Script Alphabet Rubber Stamps for your addressing, pairing them with the Prima Press Stamp Holder for straight lines and consistent spacing. Elevate your invitations even further by embossing the letters with the VersaMark Watercolor Inkpad, a choice of embossing powder and the Embossing Heat Tool. For a truly stunning effect, we recommend a metallic embossing powder such as silver or gold. If these suggestions seem too time consuming or labor intensive, printing your envelope addresses is another option. Find and download a font of your choice and craft your address designs digitally. Consider contacting the printer of your wedding invitations to get the name of the font used to correspond with your envelopes. There are also unique ways to add a return address to your envelopes. Check out these creative ideas. The most common form of adding a return address to your invitations is with custom return address labels. Make sure to check out Paper Source’s assortment! 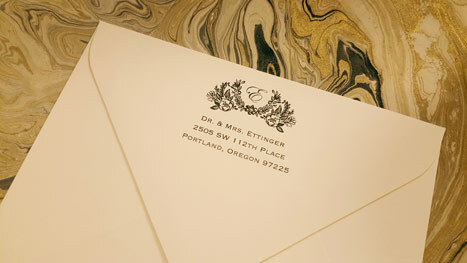 Many have been designed to match our wedding suites, making for a cohesive invitation from beginning to end. We also have designs that pair beautifully with any and all invitations. 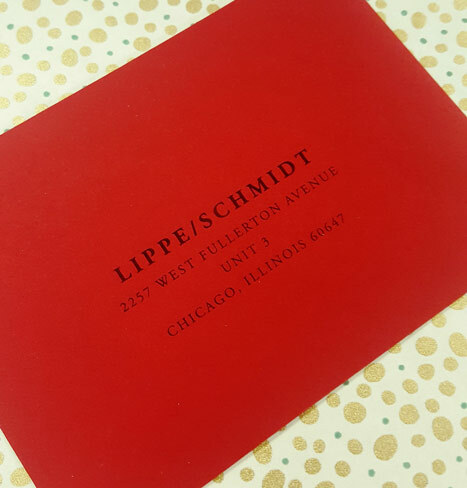 Impress your recipients with an embossed return address. Order a custom embosser in one of our many designs to print onto all of your wedding invitations. The best place to apply your embossed return address is on the flap on the backside of the envelope. Yes, it may be tedious, but the end result will be a stunning invitation. For more space to hand letter your return address, use the flap on the backside of the envelope. Seal it with a sophisticated sticker or a wax seal. wow! that is a beautiful color. I have one very similar on my walls! haha. Gorgeous! Creativity always give some design & in your post I really impressed from new creative wedding invitations.